Century Cycles in Medina will be hosting our second annual Mountain Bike Skills Clinics! If you’ve always wanted to give that "biking in the woods" thing a try, then these clinics are for you! 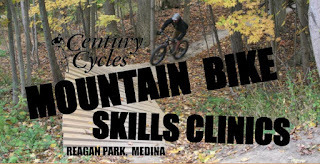 Each clinic will cover a series of MTB skills, as well as present insightful tips and tricks, to help improve your technique and riding confidence over all types of terrain. Whether you're brand new to mountain biking, or a seasoned veteran, you'll be sure to pick up some valuable skills to make your experience on the trails more fun! FREE and no pre-registration is needed; just show up! And here's what else you can expect! Representatives from Pearl Izumi and Shimano will be at our events to talk about the latest and greatest off-road cycling products! NEO's local Liv Cycling Ambassador, Patti Grauel, will be on hand to ride the trails and connect with our female cyclists! Riders who attend any clinic will receive certificate good for 10% off accessories at Century Cycles! Riders who attend all three clinics will receive a MTB Skills Diploma plus a certificate good for 20% off any one accessory at Century Cycles!